There are at least 2400 prehistoric carved rocks scattered across the Scottish landscape, and a further 4000 in other parts of Britain. Many carvings are discovered every year – almost a thousand have been recorded in the last decade – and it is likely that more are still waiting to be found. A large number of carvings have been destroyed or eroded away over time, and the total number of carved rocks may have originally been significantly higher. These curious carvings were created and used by early farming communities in the Neolithic and Early Bronze Age, between around 6000 and 4000 years ago. Scotland’s rock art is not isolated – there are thousands of similar prehistoric carvings in many parts of Britain and western Europe. Although the carvings are widespread, we know very little about their original purpose, and they remain one of the most intriguing aspects of our past. You can learn more about this on our Rock Art and Meaning page. You can explore Scotland’s rock art using our map and database search. If you want to look for undiscovered rock art, you can find out more on our Finding Rock Art page. What do the carvings look like? 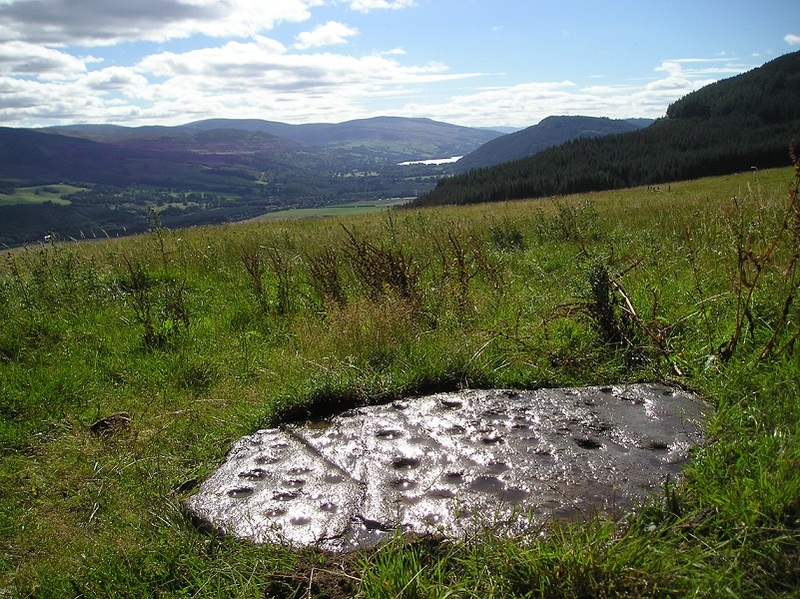 Almost all prehistoric carvings in Scotland are ‘abstract’ symbols, or motifs. This means that they do not look like anything we recognise today, which makes them even harder to understand. By far the most common type of carved symbol is the cupmark – a roughly circular hollow in the rock surface. Cupmarks are often surrounded by one or more concentric rings, and these motifs are known as cup and ring markings. Also common in Scotland are carved linear motifs, or grooves. There are also a wide range of subtle variations on these simple motifs, such as rosettes (a circle of cupmarks surrounded by a ring), or pennanulars (a central cupmark surrounded by one or more incomplete rings). You can see more of the motifs here. These symbols can occur on their own on a rock surface, or they can be combined to form complex designs. Interestingly, each design is unique. The carved symbols are also often associated with natural features on the rock surface, such as hollows, cracks, or raised areas. This was probably deliberate, and may have been very significant to the people that made the rock art. The types of motifs used and their relationship to the rock surface differ across Scotland. Part of our task is to explore how the rock art varies in different regions and places in the landscape. Where are the carvings found? Scotland’s rock art is not evenly spread across the country. 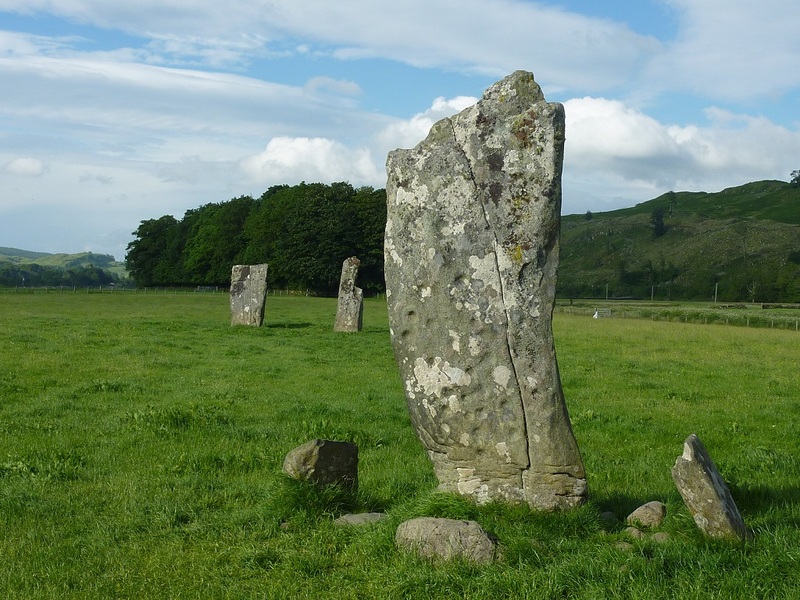 There are concentrations of carved rocks in parts of Argyll and Bute, around the south coast of Dumfries and Galloway, and in Perthshire and Angus. Some areas, including much Highland Scotland and the Borders, appear to have few, if any carvings. During the project we will investigate whether this distribution is realistic and why particular places were chosen for carving, or whether some of the ‘gaps’ are simply where people have not looked. The motifs are typically carved on boulders and outcrops in the open landscape. They tend to be on flat or gently sloping rock surfaces, although there are a few examples on vertical rock faces, such as at Ballochmyle in Ayrshire. The carved rocks (known as panels) are typically found in more low-lying locations, such as fertile river valleys and on hillsides, in the sorts of places where people would have lived and farmed in the past. They also seem to follow natural pathways through the landscape, many of which have been used historically as drove roads, and more recently as walking routes. 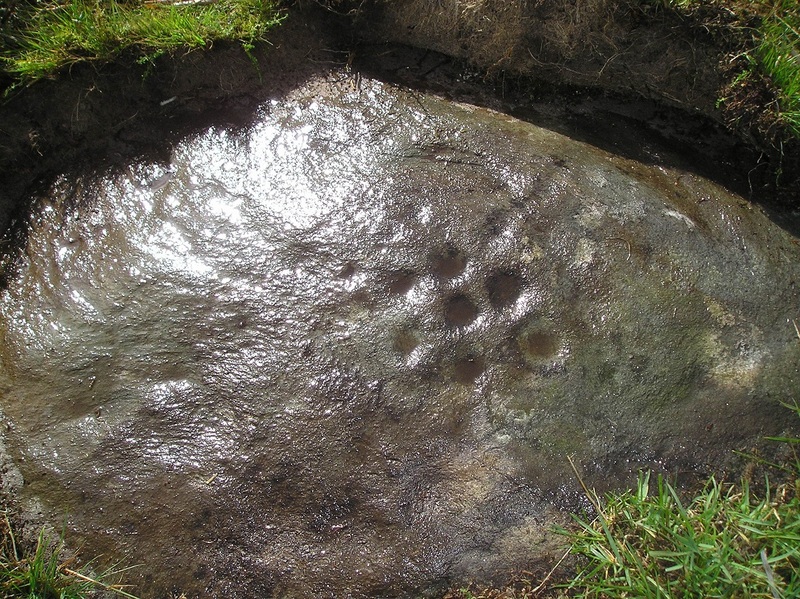 Cupmarks and cup-and-ring markings are occasionally found on rocks built into Neolithic and Early Bronze Age monuments, such as burial cairns, stone circles, and standing stones. Some of these carvings appear to have originally been on natural rock surfaces in the open landscape, then deliberately quarried or moved for re-use in the monuments. Others were made when the monuments were constructed. Carved stones are also re-used in later structures, such as Iron Age hillforts, brochs, and souterrains, or Pictish symbol stones. This suggests that they had long-lasting significance for these communities. There are also many carved stones built into more recent features, including field walls and houses, although this re-use is rarely deliberate. How were the carvings made? The carvings are made by hitting the rock surface with a stone tool, such as a large river-washed pebble, to create a shape. This process is known as ‘pecking’. We can often still see the individual peck marks from the impact of the stone tool. Experimental carving shows that it can take about half an hour to produce a simple cupmark on ‘soft’ rocks such as sandstone, and over two hours on harder rocks such as granite. Complex carvings would have taken a considerable time to create if they were made in one go, but many carved rocks may have been produced by adding or modifying motifs over an extended period. Excavations of carved rocks in Scotland have recovered large quantities of quartz and quartzite pebbles, some of which have worn edges and appear to have been used to make the carvings. You can read more about this work in our Research section. There is no evidence that the carvings were coloured, although small fragments of a natural pigment (red ochre) have been recovered from excavations of a rock art panel at Hunterheugh in Northumberland. Colouring may not have been needed as the process of making the carvings cuts through the dark, weathered surface of the rock to expose the contrasting colour of the unweathered rock beneath. Freshly made carvings would have been very striking and visible, but would have faded over time as they weathered. Experiments show that carvings weather to the same colour as the rock surface within a few years. They may have then been made visible again by re-carving. The motifs were probably made by people living in or visiting the area in which the carvings are found. Beyond this, we do not yet know whether only certain people in the community could make the carvings, or whether anyone could make them, but only on certain occasions. Experiments show that creating these types of motifs does not depend on physical strength – everyone can produce similar marks regardless of age, gender, or ability. We know from studies of societies in other part of the world that rock art was produced by people with special ritual status. It is possible that Scotland’s rock art was created by ‘ritual specialists’, or people with a particular role in the community. 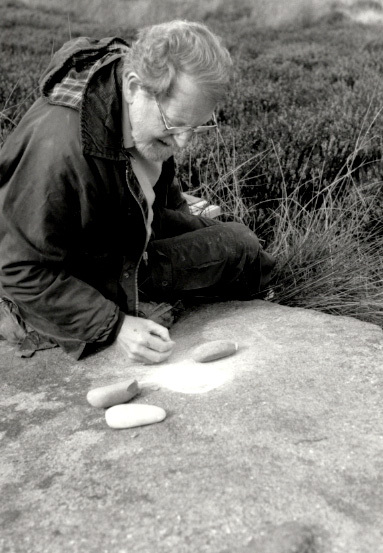 Experimental Archaeology in action (Photograph by tertia barnett, fading rock art landscapes project). Rock art is one of the most fascinating and enigmatic traces left by our ancestors. It has been created for thousands of years, and is still produced today in certain parts of the world. The term rock art refers to human-made marks or images that are deliberately carved, painted, or sculpted on natural rock surfaces. 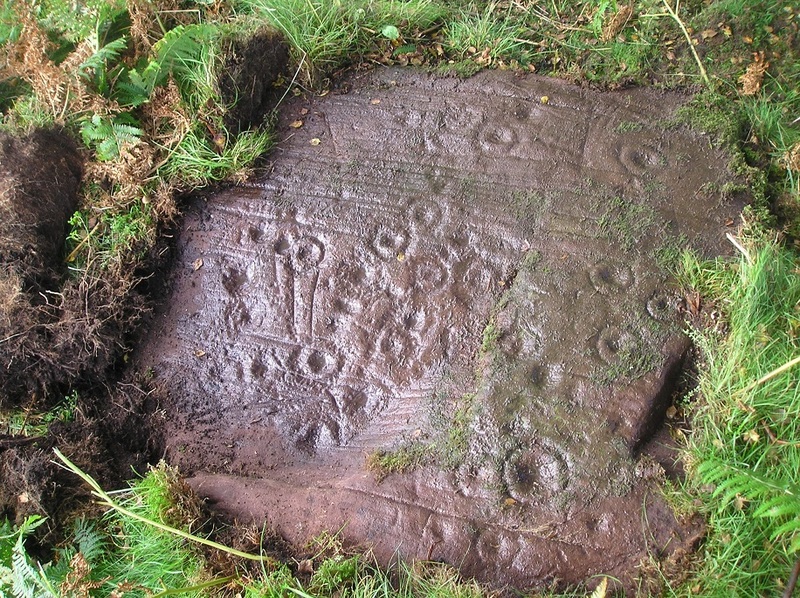 Britain and Ireland share a similar tradition of prehistoric carving. In the British Isles, carvings of cup-and-rings, cup-marks, and similar images were engraved on boulders and outcrops in many parts of the landscape. Rock art is widespread in Europe and very varied, ranging from the Paleolithic Caves of Spain and France, to the Italian Alps, Southern Spain, and of course the Atlantic Art common to many countries in western Europe. 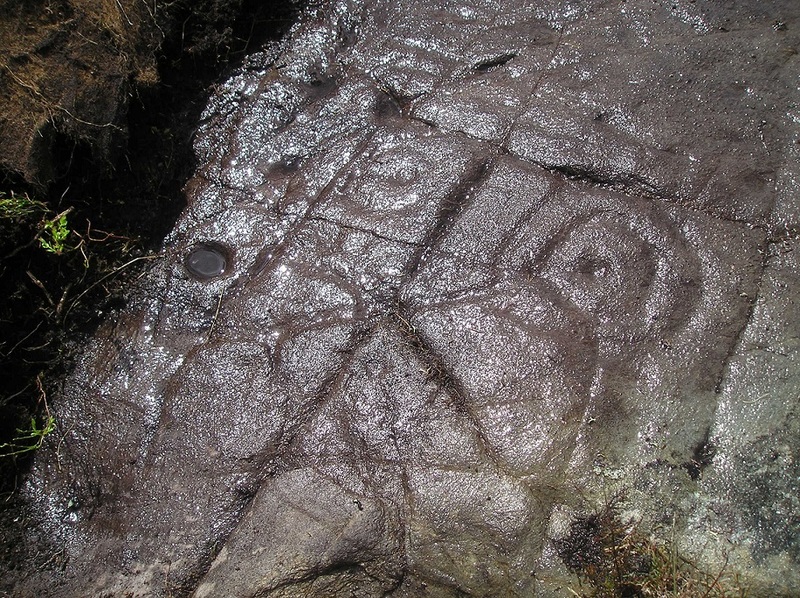 Rock art is a global phenomenon. Paintings and carvings have been created for thousands of years on walls, shelters, and rock surfaces in the open air in many parts of the world. Have a glimpse of some wonderful and mysterious rock art in this section. The oldest written reference to rock art in the British Isles dates back to the 19th century. Interest in Britain's rock art has grown over the decades and it is now a well-established academic subject. Dating rock art is very challenging. 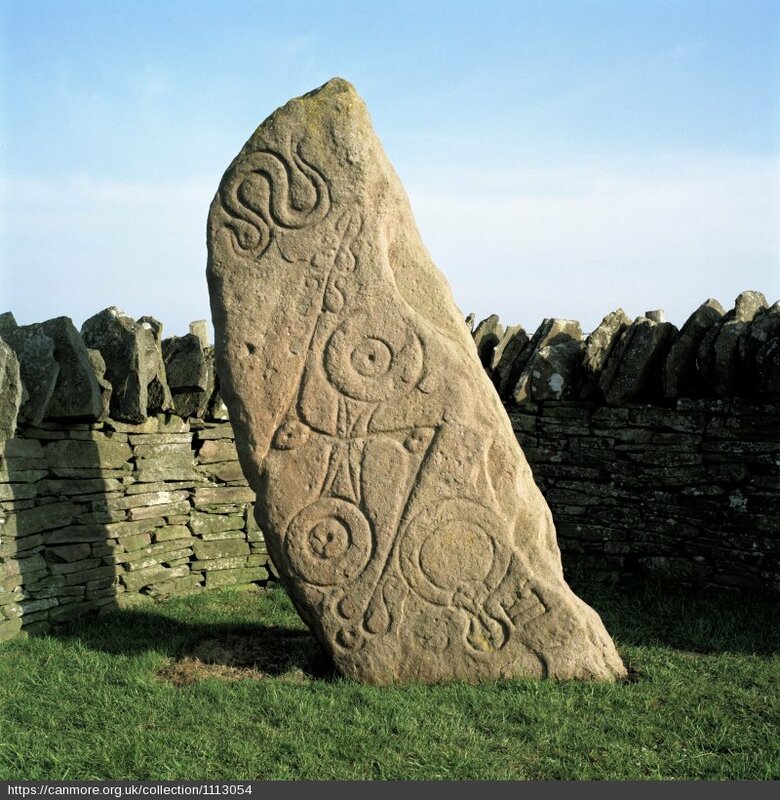 For a long time, it was thought that Scotland's prehistoric carvings were about 4000 years old, but recent research shows that they were probably made at least 5000 years ago in the Neolithic period. What do the symbols mean? This is the question most often asked, but it one of the most difficult questions to answer. There are many theories about rock art's meaning, and you can find out more about what research has revealed in this section.